the subversive act of finding a sense of place. I'm going to move Turtle Island Economics to the garage for the known future, as I'm starting a new blog with Urbana.org. It's called All Things New: A Conversation about Who We're Becoming. I hope you join me there. All Things New is about exploring our world with an attitude of big-hearted curiosity. 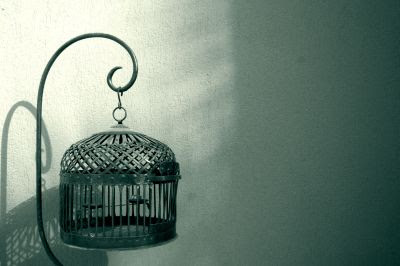 This blog grows out of three distinct spiritual-intellectual turning points in my life. At the age of sixteen, my father taught me the attitude of curiosity. We were in process of relocating to the United States, after several years in Switzerland. Destination? Wisconsin, a quiet state in the north-central part of the country. I was unimpressed. I had hoped for someplace exciting, as defined by an expatriate teenager whose window to America was Hollywood. With that short little instruction, my life was changed. I found tallgrass prairies and persistent ethnic neighborhoods. I found a major American regional dialect shift taking place; I found all kinds of foods I had never previously tasted. In short, I discovered that Wisconsin—and by extension the entire world—had far more treasure to it than I understood as a media-saturated adolescent. Curiosity is no accident: it is a willingness to remain enchanted by the world, when disenchantment is the natural response. If, as Norwegian philosopher Lars Svendsen asserts in his small masterpiece A Philosophy of Boredom, boredom “contains a rejection of—or rather detestation of—God and his creation (p. 50),” curiosity is boredom’s inverse. Curiosity and faith are intertwined. A few years later, I was studying at the University of Wisconsin, a large and worldly institution dedicated to “ever encourag[ing] that fearless sifting and winnowing by which alone the truth can be found” (the school’s motto). I was genuinely saddened and, well, disenchanted to discover: not all thinkers were interested in finding the truth. Many seemed more interested in critique. All the Athenians and the foreigners who lived there spent their time doing nothing but talking about and listening to the latest ideas (Acts 17:21). To rephrase in terms of my school, they were more interested in “sifting and winnowing” than in “finding the truth.” They were dedicated to endless, rather than fearless, sifting. Intellectual maturity, it struck me then and now, involves fearless sifting, followed by fearless grasping of what truth can be grasped. Skepticism, though useful as a tool for sifting and winnowing, can often paralyze the soul. Again a few years later, I was on staff with InterVarsity. An aging lion of the Civil Rights Movement addressed a national staff gathering, with a message of Christian humanism. Years of digging for truth had shown me the empty foundations behind humanisms of all stripes, which I confidently shared with my team during the subsequent debriefing time. To say that God and God’s truth are bigger than comprehension is not to succumb to cynical relativism. No: it is to balance our search for truth with a willingness to grasp it even when it comes bundled with nonsense. If the risk of broad curiosity is seduction by untruths, the risk of unbending insistence on orthodoxy is that of becoming an unbending soul. Okay, so what? Here’s what I’m trying to accomplish with All Things New: I want to invite you—readers—to join me in this quest. I will unearth treasures—cultural, ecological, theological, and interdisciplinary—and try to share them with you. I want to hear your thoughtful, big-hearted opinions, and I want you to read others’. Together we might discover something important. I read a lot of books. I cross cultures daily, in my neighborhood and through my church. I take my kids on field trips to the park. I listen to missionaries’ stories whenever I get a chance. Whenever my toe strikes something worth sharing, I’ll let you know. Meanwhile, if you find a treasure of your own, that you want to discuss, let me know; I’ll see what I can do. I went to a nearby town recently, to hear a yodelling concert. New Glarus, Wisconsin is a town founded a hundred seventy years ago a Swiss emigrant community. They far more than cling to old traditions: they cultivate them, and keep them alive. 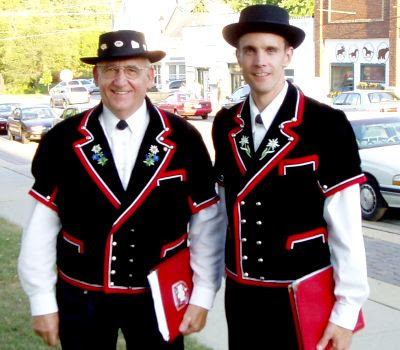 Here are two members of a local choir, getting ready for a concert. A fascinating article in Eurozine on Bulgarian migrant workers examines the ways global capitalism demands a deep rethinking of the very concept of home. Basically, a huge percentage of Bulgarians are displaced laborers across the European Union, quite often "without papers." Their fate in many respects resembles that of undocumented Mexicans in the US: forever in danger of being deported, they end up under the control of coyotes, sometimes as near-slaves. As illegal residents, they have a relationship to the host society that is ambiguous at best, and certainly offers no chance at integration. Here's the question that kept returning to my mind as I was reading: to what extent are American citizens, in full possession of citizenship, thrown into the exact same cultural no-man's-land? How many condos are mere bedrooms for a transient class of professionals, whose belonging to their place begins and ends with their current job? How many of us would suffer very little loss if our entire cities were to burn to the ground, forcing us to up and relocate? I'm reading a tasty book on endangered foods of North America. It's got everything from "Tennessee Fainting Goats" to all kinds of berries, beans, and corn varieties I'd never heard of. The authors of Renewing America's Food Traditions: Saving and Savoring the Continent's Most Endangered Foods broke North America down into ecological "nations" sharing traditional staple foods, from "Maple Syrup Nation" in the northeast, to "Bison Nation" in the plains, to most appropriately, "Acorn Nation" (California). For each region they highlight several perfectly good foods, that have been left along the wayside for any of several reasons. Mission grapes, for instance: A type of grape grown for wine at Spanish-Californian missions. The breed suffered two setbacks, from which it barely survived. The first, of course, was California's transfer to the United States, which hastened the end of the missions, after which many were abandoned. The second was prohibition, during which period most of the remaining vines plowed under for other crops. When California's wine industry returned, it was designed in competition with French wine. French grapes like Merlots and Chardonnays were planted. Most growers had never heard of Mission grapes, until one grower discovered feral mission grape vines in a sage-covered hillside she had bought. Apparently left to their fate a century ago, these handful of vines survived and have now been restored as a novelty wine, produced in only a few cases a year. Meanwhile, some fruits--like Paw-Paws--are too fragile to transport in trucks and crates. 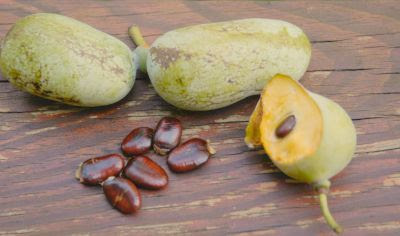 I have never had a Paw-Paw, although archeologists have found paw-paw seeds among native kitchen scraps right in my neck of the woods. It's possible to grow them here, but we stick to a half-dozen varieties of apples. There are several stories like this, and page after page I grew more amazed at how impoverished my supermarket is. There can't be more than a few dozen fruits and vegetables in the produce section rotation; or a dozen meat animals. The authors of Renewing America's Food Traditions have opened my eyes to endless new possibilities. Beyond the joy of variety, however, lies a deeper issue: if we're ever going to survive a national interruption to our transportation network - whether in the form of terrorism or simple unaffordability (fuel prices) - it will be because our neighborhoods and surrounding counties have figured out how to feed themselves with crops uniquely suited to their conditions. One of the strange aspects of living across the tracks in a college town is seeing life go on, year round, with no hint that another part of the city is alternately bustling or vacant. It is my pleasure to announce, then, that the Badgers are back in town. This clip accurately portrays gameday atmosphere, albeit without profane chanting, drunken staggering and puking, and broken bottles on sidewalks. Badger games are fun (although I haven't attended one in three or four years). These tribal gathering are impressive. It is to Badger home games that alumni typically refer in their fondest memories; the home games, then, are highly significant for "Badger Nation" identification, i.e. fund-raising. This is an ugly man. Or was, rather. He was an Etruscan, one of the indigenous tribes of Italy, whose civilization was wiped out by the Romans. Etruscan art is notable for its depiction of normal people, warts and all--a stark contrast to the heroic obsessions of the Romans. The professor who taught me these things felt it important to note that a measure of a society's cruelty or kindness is its treatment of the disabled. 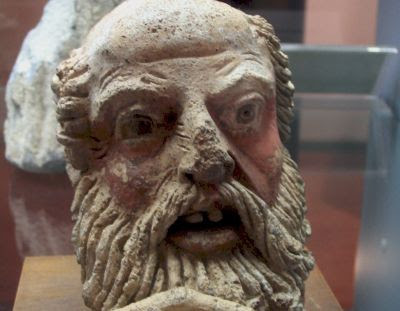 In the case of the Etruscans, their willingness to depict ugly people suggests a similar willingness to include them in their society. Which brings us to Sarah Palin. Andy Crouch notes in Culture-Making that the Republican Vice-Presidential candidate's now-famous decision to keep her Down Syndrome baby is an instance of cultural leadership. In a nation where 85% of Down Syndrome babies are quietly aborted, Palin's is an expression of inclusivity. So far, so good. But it's a creepy thought to consider that (in the media's eyes, at least), her decision is noble. In fact, if we really believe in inclusivity, tolerance and democracy, we oughtn't bat an eye about Palin's decision. It shouldn't be heroic to make room for the disabled. The general acclaim about Palin's heroism testifies more to the hidden shame in our society of our hidden intolerance for the weak, the ugly, the disabled and the outsiders. PHOTO CREDIT: Flickr user diffendale. I live in Madison, Wisconsin, and am the author of Blessed Are the Uncool: Living Authentically in a World of Show. I was born in Idaho, raised in Switzerland, and live in Wisconsin. You can find me elsewhere at ..